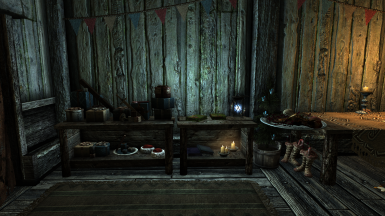 Port of the holiday themed shop from Oldrim to SSE by Jokerine. 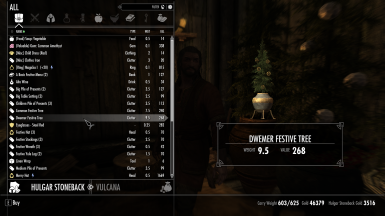 Bring the Holiday spirit to Skyrim! to insure compatibility with SSE. 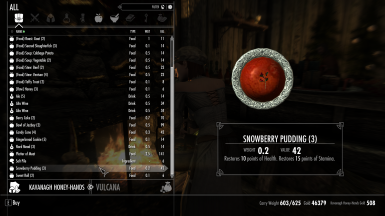 Since this is a port, this mod is offered as-is and will not be getting any support from Jokerine. in my game to make sure it works. This should be compatible with everything unless another mod occupies the same space as this one. Check to make sure. 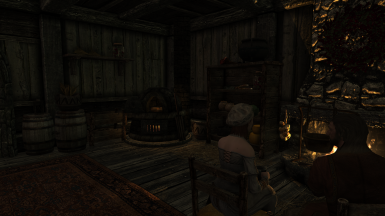 Not many mods use that area of the Solitude Lighthouse as far as I know. 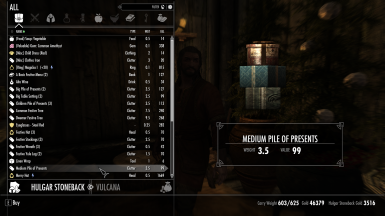 I would probably let LOOT sort this one for you unless you know what your doing with your load order and have experience. The Merry Snowberry is here to celebrate Saturalia! 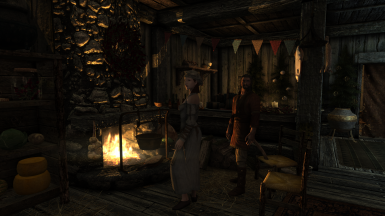 This holiday is traditionally celebrated on the 25th of Evening Star, so get ready to decorate your home with the fine items and apparel you will find in this humble little shop. 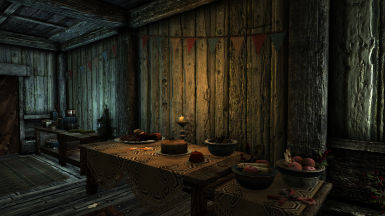 The Merry Snowberry is located at the Solitude Lighthouse, at the very northernmost of Haafingar Hold. 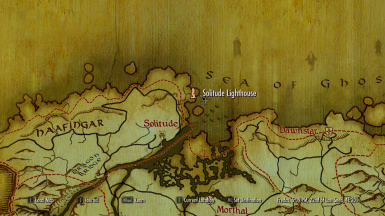 There is no map marker specifically made for the little shop, but the Lighthouse itself has a marker that needs to be discovered before you can fast travel. 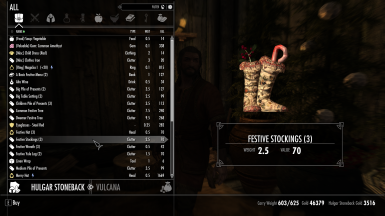 will sell wrapped presents, some table decorations, candles, spell and recipe books, festive trees and hats, for you to place around your home. 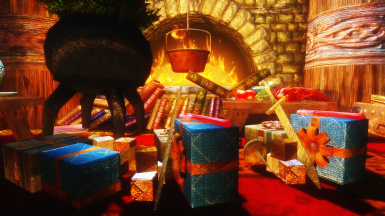 The presents do not do anything, so don't expect to activate them in your inventory and receive a full set of Daedric armor! The candles also do not emit light, although they have an animated flaming wick. 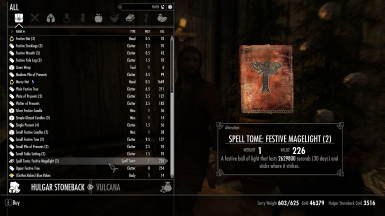 To compensate for this, I made a simple, silent variant of the Magelight spell that will last for 30 days, allows you to place multiple lights, and requires no Magicka to be cast. 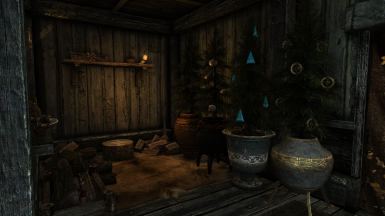 About the trees, I made four variants, a plain one with no decorations, a common one with simple round ornaments (based on the model of Meridia's Beacon), an upper one with retextured Soul Gem pieces (they point to the texture of the Greater Soul Gem, because the original texture was too dark), and a personal favorite, the Dwemer one, with downsized Dwemer gyros. I also included a smaller tree in case you think the others are too big. They have no animations; I tried to give them some visual magic effects, but they kept making my game crash, so I discarded the idea. 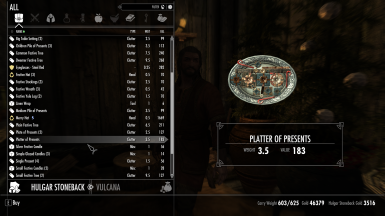 All items in the mod, with two small exceptions, use vanilla textures to reduce filesize, so they may look a bit different in your game. 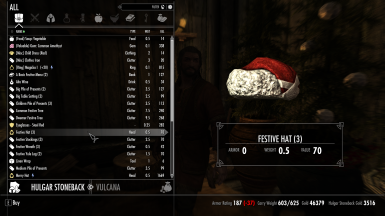 The only custom textures are the outside sign, and the festive hat. As I was feeling adventurous, I decided to include some apparel, but after failing spectacularly at making proper clothes (I'm not a very good texture maker and I couldn't import even vanilla clothing meshes as standalone...), I settled for the hat. The enchanted version will slightly increase the chance of successfully persuading someone when worn. 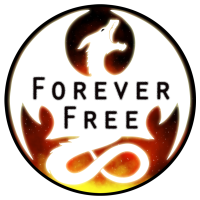 The store will be open all day for you to browse (because I cannot for the life of mine make working locklists), but items will be sold only from 8 AM to 8 PM. It also is fully navmeshed, so bring along your friends! Just be careful not to bump things and send them flying across the room. The Merry Snowberry was also included in Skytts' "Fallout New Vegas and Skyrim Mods Weekly - Christmas Special!" Skip to 07:20! 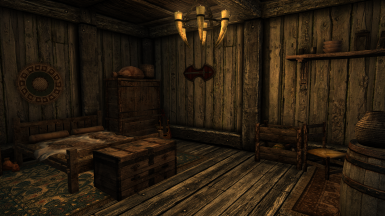 Because this is Skyrim we're talking about, my items tend to spazz out and jump around when you place them too close to each other, to other things, or whenever they are touched by an NPC or the player. Not much I can do about that, unfortunately. If you want to get the items but don't/can't afford them, open the console and type "help festive" to get a list of IDs. You can then use the "player.additem" command to get the items you want. allow the regular Magelight spell to be cast more than once. 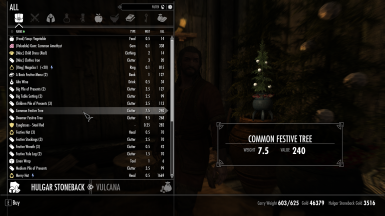 So, if you have a mod that limits the amount of Magelights, there could be conflicts. 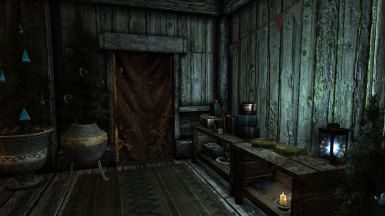 Besides this, the mod should be compatible with anything, unless there is a mod out there somewhere that makes massive changes to the Solitude Lighthouse. 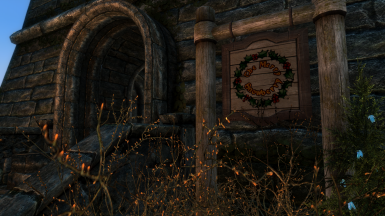 In that case, there may be issues such as the entry to The Merry Snowberry being nothing but a floating door. - 20 November 2013 - v1 - First release. 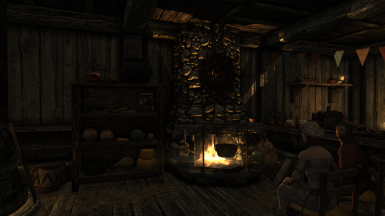 - 21 November 2013 - v2.1 - Quick update because I forgot to add the cooking recipe book to the merchant list. 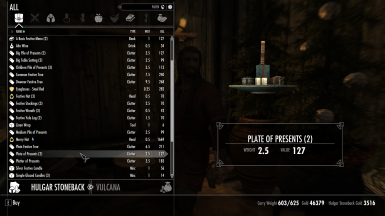 - Craftable and moveable alchemy and crafting containers, by Zaria, so you can store presents for your loved ones under your tree. - Skyrim Toy Story, by jacknifelee, for more presents! - Lanterns and Candles, by Mentilreq, for more candle variety. - Christmas Lanterns, by MannyGT, for a dash of color! - Strotis Ovens Resource, by Stroti and Tamira. - Modders Resource Pack, by Oaristys and Tony67. - FPI Experiment Pack 1, by The Fuzzy Physics Institute. 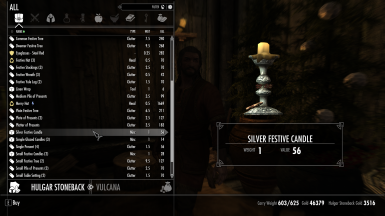 - Christmas Resource, by InsanitySorrow. 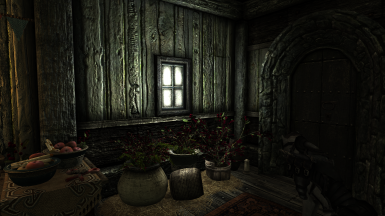 - Red fabric texture, by Mayang. - Wreath clipart, by Cool Holiday Graphics.